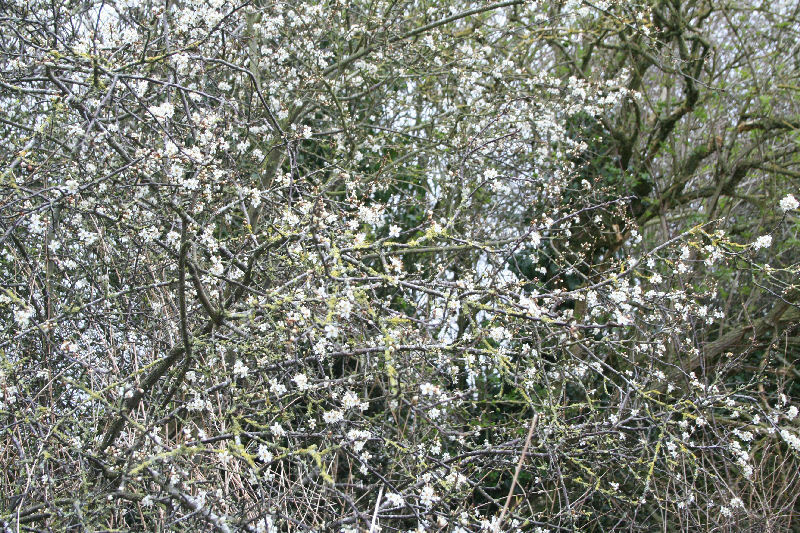 Prunus spinosa Not only does it produce the sour wild plums known as 'sloes' with which you can make the delicious Sloe gin or jam, but it also provides dense hedging useful to birds, butterflies and much other wildlife. 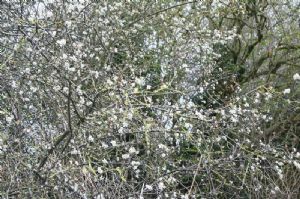 Shown here in flower, unlike Hawthorn that flowers later, Blackthorn flowers appear on the bare branches before the leaves - some of the earliest spring flowers. The foliage is sometimes eaten by the larvae of Lepidoptera including Emperor Moth, Common Emerald, November Moth, Pale November Moth, Mottled Pug, Green Pug, Brimstone Moth, Feathered Thorn, Brown-tail, Yellow-tail, Short-cloaked Moth, Lesser Yellow Underwing, Lesser Broad-bordered Yellow Underwing, Double Square-spot and the Black and Brown Hairstreaks.